Well, the holidays are officially over and many of us are already looking ahead to Valentine's Day. Do you typically plan a romantic weekend away or do you usually stay home? Hubby and I look for quick getaway deals and usually spend a romantic weekend away where it is just the two of us. For those of you who live in California or who are willing to travel to the west coast, the Blue Dolphin Inn is offering some very special romantic packages for travelers. These travel deals would be perfect for the upcoming Valentine's Day holiday or for any quick weekend getaway. Here is all of the information. Blue Dolphin Inn’s “Coastal Romance Package” Couples Beachfront Accommodations with a Classic Wine Country Experience. Lovers seeking a luxurious retreat on California’s Central Coast will be smitten with Blue Dolphin Inn’s “Coastal Romance Package,” a special offering that treats couples to oceanfront sunsets, a taste of Paso Robles wine country and other sweet surprises. 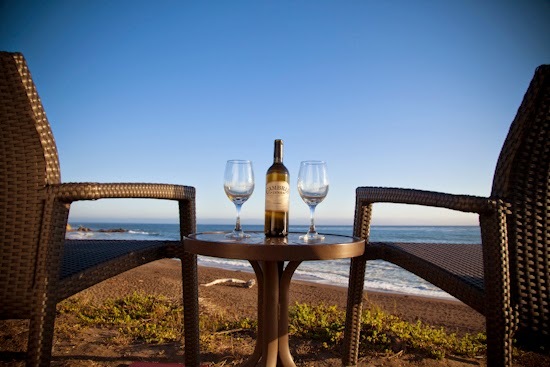 Available from February 1 to March 26, 2015 (exclusions apply*), the package provides the perfect romantic getaway, offering guests a chance to get cozy in Blue Dolphin Inn’s beautiful accommodations along Moonstone Beach in Cambria, CA. A breathtaking home base for long walks on the beach, the charming boutique hotel also brings guests to nearby Paso Robles wine country as part of the Coastal Romance Package, offering an unforgettable and sensual experience tasting the region’s highly-acclaimed wines. Blue Dolphin Inn is part of the Cambria Inns Collection, a group of distinct boutique hotels located halfway between San Francisco and Los Angeles in beautiful San Luis Obispo County, CA. The group’s four Cambria, CA hotels, situated off iconic California Highway One and just steps from pristine Moonstone Beach, offer breathtaking ocean views, comfortable accommodations and convenient access to a bounty of area activities, from Hearst Castle to the acclaimed Paso Robles wine region. Cambria Inns Collection includes the luxurious Blue Dolphin Inn and private Moonstone Cottages; the family-friendly Castle Inn; and the warm and welcoming Sand Pebbles Inn. For property information, visit www.cambriainns.com.